Building your custom home is likely one of the largest investments you’ll make in your lifetime, you want to get it right by choosing the best items for your lifestyle. You’ll have ideas for your needs and wants list: the items that go into making your custom home the luxury dream home you desire. What are your needs and wants? Do you need large appliances? Do you want to incorporate new technology into your home? Are there decor themes you have in mind? You may not have a clear idea of what your needs and wants are yet and you’re currently looking for ideas. If so, this article is made for you. Read to learn more about luxury items for your custom home’s kitchen and bathroom. For luxury in the kitchen, steam ovens are the home cook’s dream tool. They cook food faster while keeping foods crisp on the outside and tender on the inside. Cook a 14 lb turkey in 90 minutes! Cook multiple dishes at the same time without adding cooking time. Foods lose fewer nutrients due to the shortened cooking times, your food is healthier too. 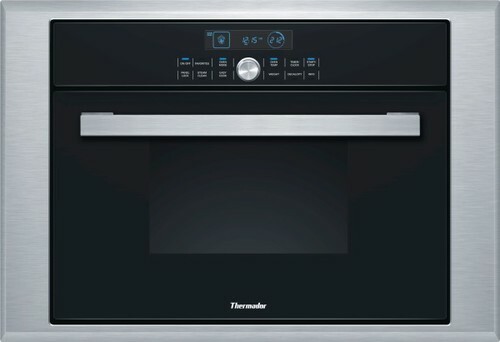 Thermador has a line of steam ovens that are sure to impress: they come ready-to-use, with no need to hook them up to plumbing. Just fill the water jug and you’re cooking. Our clients love their steam ovens! 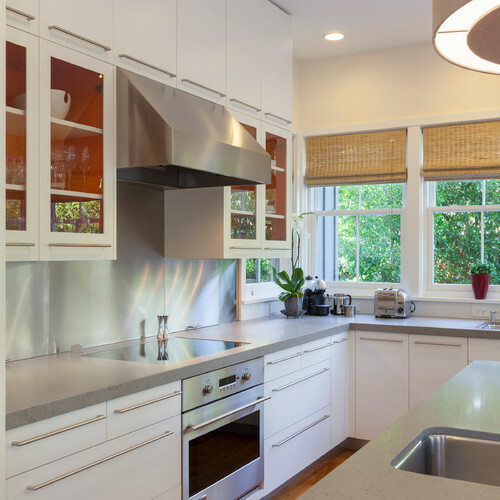 For decades, stainless steel appliances have been in high demand. The timeless, clean look of stainless looks great in just about any kitchen. Now, homeowners have the option to buy appliances in black stainless steel. Black stainless gives a sleek aesthetic with the added benefit of being easier to clean (fingerprints and smudges wipe off with a dry cloth). Metallic finishes on plumbing and lighting fixtures in the kitchen are still very current. 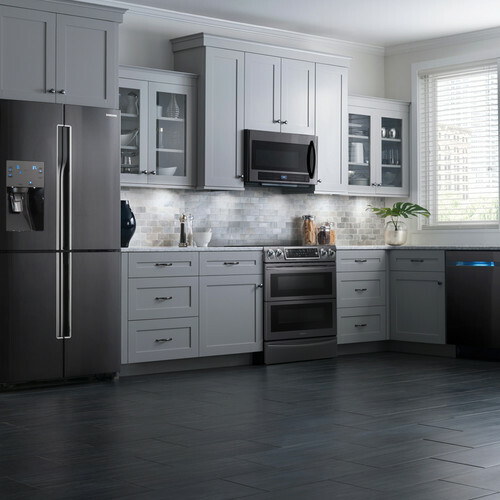 Having black stainless steel appliances to complement them can up the “wow factor” significantly. It depends on how you cook, those who frequently entertain or cook large meals enjoy their wall ovens. They save you from bending to open your oven (many also have side-opening doors) and straining to lift heavy items off the lower racks of a conventional oven. Whether you’re tall or short, the wall oven will save your back. 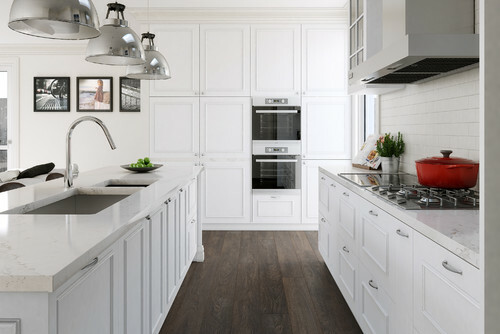 Miele and Wolf offer high-end wall ovens that have modern features and stylish appearances. Trouble choosing a favourite? Read about the benefits of each in Miele vs. Wolf. Induction cooking is a modern miracle that sounds like something out of a science fiction novel: they use an electromagnetic field rather than thermal energy (from a flame or electricity) to cook food. When the element is turned on, it won’t get hot until a pot is put on it. Once the pot is removed, the element cools down even if the element is turned on. Induction cooking is faster than any other cooktop, which is great option when you’re making a quick meal. However, induction ranges/ovens perform about the same as conventional ovens. One drawback is you will need to have induction-specific cookware. Pictured below is the sleek, modern GE Monogram Induction Cooktop. Smart ovens offer added safety and convenience in the kitchen. Miele is a premium appliance brand that produces the highest quality, most reliable ovens in the industry. They are pioneers in oven technology. Many of their ovens have M Touch control, which allows you to connect to your appliance through an app on your phone. This gives you control of your oven remotely. Never worry about whether you turned the oven off. Simply check your phone and switch it off from wherever you are. M Touch is just one of the cool features their ovens have. See the full line of Miele Convection Ovens and their specs here. Gone are the days when your only options for washing clothes were the load size and the temperature of the water. Modern laundry machines come with all kinds of features and options. The Whirlpool® 5.2 cu. 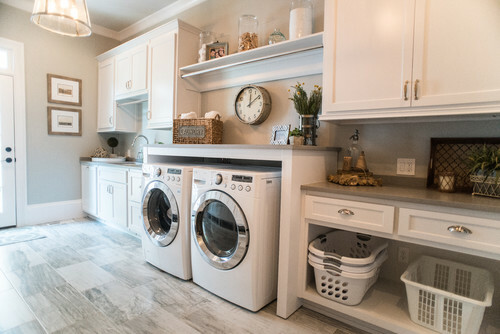 ft. Front Load Washer with TumbleFresh™ is a large-capacity, eco-friendly, high-tech washer with controls that allow you to do your laundry with precision. It also has a convenient setting, TumbleFresh, which will tumble clothes periodically to keep them from wrinkling when you don’t transfer the load right away. Our clients love the front-loading, efficient, large-capacity washers in their homes. We have also received requests for stackable laundry machines in the master walk-in. The idea of having your laundry facilities in close proximity to your where your clothes will end up just makes sense. BlueStar and Thermador both sell ranges that have interchangeable parts. There is an option to switch out a couple of the burners for a grill or a griddle. Brew craft beer on your kitchen counter with these new countertop beer brewing machines from Pico Brew. You can order the ingredients online, and they will ship to your door. Once the machine is started, the beer is ready in about two hours. It will ferment for approximately a week and you will have 5 litres of fresh, craft beer to enjoy. Since it sits on your countertop and isn’t built in, this item isn’t something you have to customize your home for. It is a trending luxury item for your kitchen that you can purchase afterwards. Touchless flush is standard in public restrooms, however the technology is only starting to come to the modern home. Enjoy germ-free flushing with the Kohler Touchless Toilet. Just be sure to educate your guests! The look is very sleek, it saves space, and it’s easier to clean. Duravit carries a wide selection of “floating” toilets to suit your style. Complement your wall-mounted toilet with a wall-mounted vanity. Again, these are stylish, modern, and easy to clean. In addition to those benefits, some of our clients ask us to install lighting on the underside of these vanities to give off a soft glow, providing ambience, a night-light and making it easier to find your way to the bathroom at night. Hands-free faucets are a popular request when we build luxury custom homes. For one, there is no need to twist or turn knobs with dirty hands. Two, the temperature is pre-set: no scalding. Third, they offer clean lines to suit your aesthetic. Many companies offer hands-free faucets; we recommend Hansgrohe’s top-of-the-line hands-free electronic faucets. For some, the ultimate luxury bath item is a Therapeutic Bathtub like the ones from BainUltra. They are available with heat controls, massage, chromatherapy, and aromatherapy options. Read more about these therapies and how they work in Luxury Home Spa: Decadent Therapeutic Baths and Steam Showers. Add decadence to your bathroom with a large soaker tub. Relax in warm waters up to your neck, invite your partner to join you, or wash all the kids at once. 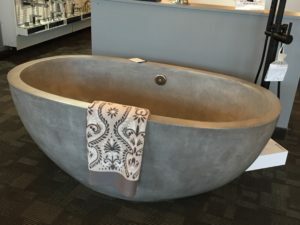 Large soaker tubs can be a show-stopper, like the concrete tub pictured below. One of our clients had vacationed at a home in Las Vegas, the master ensuite had a massive shower built for two. 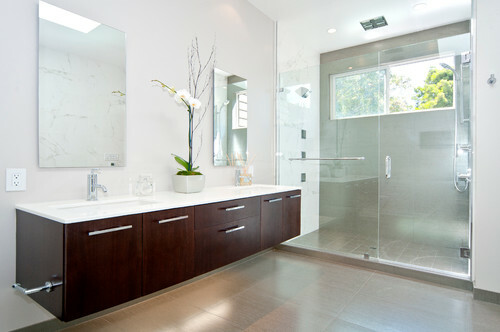 When designing their own custom home, they incorporated the same luxurious space in their ensuite. The shower had two sets of everything from showerheads to body sprays. It was like a body carwash. They aren’t the only ones who love a large, luxurious shower. A quick search on Houzz will bring up many large, custom showers like the one below (it also features a large soaker tub). Custom home bathrooms are much more custom than they used to be. Now you can choose bathroom fixtures in a wide range of finishes, like the ones offered by Aquabrass. Mixing metals in the bathroom is still on trend. With all the new options you can choose the finishes that perfectly match your style. What is on Your List of Luxury Items? When choosing items for your needs and wants list, pick things that speak to you and fit with your lifestyle and tastes. Are any of these items going on your list? Which luxury custom home items did we miss? Let us know in the comments below. If you enjoyed this blog, share it with your friends!